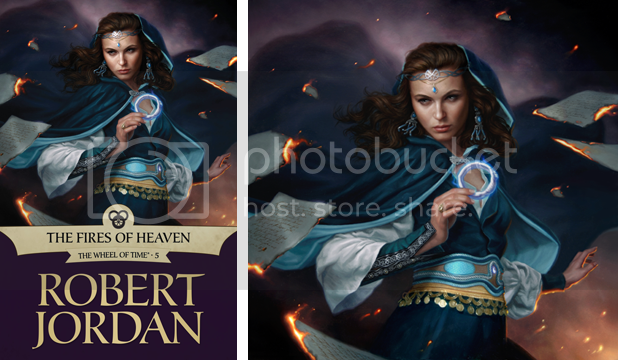 Presenting!...The next of our Wheel of Time ebook covers: The Fires of Heaven with art by Dan Dos Santos. Dan had the unenviable task of having to paint a preternaturally beautiful and ageless woman. He did a wonderful job of it, I’d say. Head over to the Tor.com post to see his sketches, progress shots of the painting, and our initial thought process. Gah. This is so effing good. Dan really out did himself on this one. Tor really should consider releasing these covers as lithographs or a limited edition portfolio. The time and effort by both the artist and the editorial staff deserves no less! As someone mentioned on the Dragonmount site, the proceeds could be used to benefit amyloidosis or even develop into a new market for Tor and other publishers. Ok that's my favorite Dos Santos painting. Print please! Dan just continues to amaze! His use of blues is unmatched. The Cover turned out great. the color scheme alone has made me a fan. And I have gotta say, Dan Dos Santos always knocks it out of the park. Such an awesome series of books happening with all these amazing covers! I can't wait to see the rest that are remaining..